Posted April 10th, 2019 by nocopf-admin & filed under News. This March marks two full years that K9 CASH has been assisting Colorado Parks and Wildlife with managing the diverse wildlife of our great state. Pheasants Forever sponsored CASH as he began his journey as a wildlife K9, by providing funds to cover portions of the K9 training costs. Support from Colorado sportsmen groups are critical in seeing programs like the CPW Wildlife K9 project succeed. I wanted to take a moment to highlight some of the job duties CASH has been able to work on this past year. Thanks again for your support! Over the last year, CASH has taken part in biological field surveys for two endangered wildlife species, served as a topic for several public outreach endeavors detailing wildlife management and worked alongside wildlife officers investigating possible illegal hunting activities. CASH spent three survey days this year using his highly sensitive nose in an attempt to locate federally endangered black-footed ferrets and Colorado State endangered boreal toads. K9 CASH worked alongside Colorado Parks and Wildlife crews to locate and document boreal toads in two locations in Northern Colorado. He also worked a night with U.S. Fish and Wildlife Service personnel at Rocky Mountain Arsenal National Wildlife Refuge, assisting in their efforts to locate black-footed ferrets on the refuge. CASH’s people friendly and outgoing personality has proven to be a great way to connect with a variety of groups to educate them on various wildlife management topics. When members of the public hear about a dog with a unique job, they are eager to learn more about the dog and its mission. Because of this, groups that are not traditionally interested in wildlife are showing an added curiosity when the topic of K9 CASH is thrown into the equation. During CASH’s second year on the job, he helped to present over 20 wildlife related talks to groups ranging from 4H youth members, elementary school science fairs, public service clubs, and campers staying at Colorado State Parks. These presentations help to connect people with wildlife as well as educating them on key wildlife management topics such as why hunting is an important aspect of wildlife management. In addition to the more traditional natural resource educational programs, CASH also made appearances on three Denver T.V. 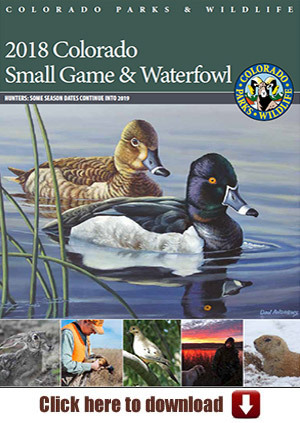 news stations, was the cover story on a nationally published magazine, a topic of discussion for Colorado Outdoors, and was detailed on a morning weekly radio show. These public outreach efforts highlighted the important work CASH is doing in managing and protecting wildlife. His unique story is helping to keep Colorado Parks and Wildlife’s mission relevant among the increasingly diverse population in the State. Last Fall an Operation Game Thief report had information detailing out-of-state muzzleloader hunters that were knowingly trespassing on a private ranch to hunt elk. CASH searched a square mile section of the ranch and was able to locate one of the hunters actively hunting on the property. CASH also located a freshly killed bull elk carcass on the ranch. His work allowed wildlife officers to gain a full confession of trespass and illegal take of a large bull elk from the hunters. CASH assisted wildlife officers with an elk poaching case that involved the harvest of two animals on one license and also take of an elk on property closed to hunting. In this situation, CASH searched a large area and found a spent rifle bullet casing that likely came from the hunter. CASH also searched the surrounding properties to confirm that no additional animals were killed. During 3rd rifle season, wildlife officers received a report that three elk were shot and left to spoil on US Forest Service property northwest of Fort Collins. The report detailed an approximate location of the carcasses, but was not real specific. CASH was deployed in the area and found all three carcasses within a 20 minute time frame. After the Fall big game hunting seasons, wildlife officers received a report of an illegal elk that may have been taken out of season. On a county road, officers located a broken down vehicle that matched the description in the poaching report. Officers noted that a large item was covered in the back of the truck bed. A K9 vehicle sniff was initiated with CASH and he alerted to the presence of wildlife in the bed of the vehicle. With this and the officers’ observations, a search warrant of the truck was authorized, which led to the discovery of an elk in the truck bed. Aside from all the above mentioned duties, CASH also found some time to help a Spring turkey hunter. The hunter approached a wildlife officer in the field and said that they had shot a turkey on a nearby Ponderosa hillside. The turkey ran off over the hill out of sight. A few feathers and small droplets of blood were found but the hunter was unable to locate the bird after an extensive search. CASH used his nose to search the timbered hillside. After about 10 minutes, CASH proudly stood over the carcass of a deceased tom turkey. The hunter was extremely grateful and mentioned to the wildlife officer that he walked right by the turkey but was unable to see it. Fortunately for CASH, he relied on his nose rather than his eyes. Without the support from Colorado sportsmen groups such as Pheasants Forever, the great successes of K9 CASH and the wildlife K9 program would not be possible. Thanks again for your commitment to preserving and improving Colorado’s sportsmen heritage. 2019 ISE Show Here are some photos from the most recent 2019 ISE Show! Stay tuned for upcoming events, banquets, and other important habitat information.